Paul Hindemith's music has a complex relationship with the events of the 20th century, as his music moved from a late Romantic idiom to a more avant-garde expressionist style to a tough neo-classicism, Germany moved from the Weimar Republic through the rise of the Nazis to the Third Reich. Rather than becoming a poster image for the Nazi regime, Hindemith's music was sidelined and the composer eventually went into exile. It is from this period that his series of sonatas for wind and brass instruments dates, from the Flute Sonata of 1936 to the Tuba Sonata of 1955. On this disc are gathered together the sonatas for brass instruments, for trumpet, horn, alto saxhorn (here performed in the version for saxophone), trombone and tuba, performed by Eric Aubier (trumpet), Nicolas Prost (saxophone), David Alonso (horn), Stephane Labeyrie (tuba), Fabrice Millischer (trombone), Laurent Wagschal (pianist on all but the horn sonata) and Helene Tysman (pianist on the horn sonata) on the IndeSens label. The sonatas were written deliberately with a sense of enriching the repertoire, but they link into Hindemith's interest in writing for unusual groupings of instruments, and yet they also depict a man who is needing to find his place in a changing world, an exile whose music is very much based in the music by past masters from his now inaccessible homeland. 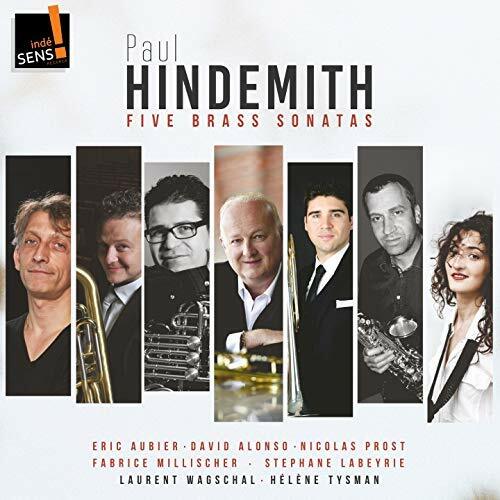 Hindemith's late style is often called neo-classical, but it is a far tougher soundworld than that of Stravinsky, and Hindemith is very much inspired by the contrapuntalism of composers like Bach. And whilst the music is technically tonal, Hindemith's use of tonality is distinctive and pushes boundaries in its own way. Listening to the music on the disc, you sense Hindemith's desire to treat the instruments in particular ways and he writes for the different instruments in ways which might seem non-traditional, i.e. which explore characteristics of the instruments which are not always exploited. Particularly, Hindemith seems to enjoy creating contrasts of textures, often with the piano providing highly articulated punctuation to the more lyrical instrumental line. Yet there are hints of a sense of humour too, just listen to the tuba sonata; it is entirely po-faced, no funny music here, yet the sheer combination of the music and the large ungainly instrument creates the possibility of humour. But, overall these are large scale (the trumpet and saxophone sonatas each last over 15 minutes), uncompromising and tough pieces; how could they not be. 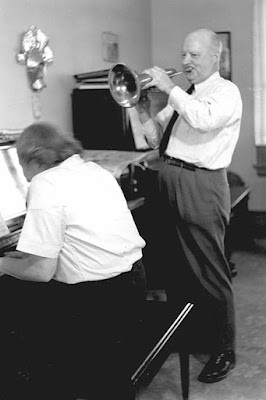 The trumpet and horn sonatas were written in 1939, in exile in Europe as the continent descended into war, whilst the trombone sonata was the first to be written in his American exile. Whilst the music is intensely serious and often uncompromising, there are characterful elements to with lots of enlivening detail, perky rhythms and lyrical moments. If you scour the catalogues you can find recordings of these works, often made by great virtuosos of the particular instrument; after all, these sonatas are major monuments. The great virtue of this set is that it brings together all the sonatas as a sequence so that we can hear the way Hindemith's writing develops of the 20-year span, yet keeps so much commonality. The performances are very strong, and fully engaged with the music. My only cavil is that the alto Saxhorn sonata is given in Hindemith's alternative version for saxophone (created because the alto Saxhorn was a rare instrument in his adopted country of the USA), so we don't quite have an uninterrupted sequence of brass instruments. It perhaps seems slightly unlikely that these are mainly French performers recording for a French label. But what counts is the music, and this disc really brings an important aspect of 20th-century music making to life.